We currently grow Navel Oranges, Valencias, Owari Satsumas, Minneola Tangelos, Moro Blood Oranges, Lemons and Star Ruby Grapefruit. Due to the current market we are removing our Pummelo grove, which was the first in production in Tulare County. This page is still under construction, more to come soon! Imported into the United States in 1870. Upon its arrival at the U.S. Department of Agriculture in Washington, D.C. it was propagated and trees were sent to California and Florida. 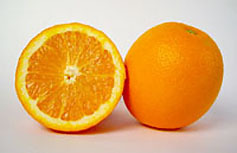 These exceptionally delicious, seedless, easy-peeling fruits quickly attracted the attention of citrus growers, and within a decade the "Washington" navel orange, as it came to be known, was the most widely planted variety in California. 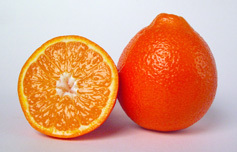 Minneola is a hybrid of Duncan grapefruit and Dancy mandarin. It was developed by the U. S. Department of Agriculture and released in 1931. The fruit is round with a pronounced neck and smooth red-orange rind that can be peeled. The flavor is rich and juicy, with a touch of its grapefruit parent’s tartness. 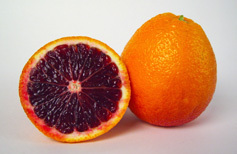 "Moro blood orange is the most common of the pigmented oranges marketed in the United States. It is of relatively recent origin and is believed to be of Sicilian ancestry. The fruit is orange-colored with red streaks at maturity. Flesh deeply pigmented and juicy; flavor described as a combination of citrus with a hint of strawberry. The original tree was located in Olinda, California as a valencia seedling in 1939. It is indistinguishable from Frost Valencia and hence is considered to be of nucellar origin. The fruit is smooth on outside, thin-skinned and very juicy. Although Valencias are thought of as a juicing orange, they are also sold as fresh fruit in the summer months. This variety is of ancient Japanese origin, probably originating in the province of Owari. The Owari was introduced to the United States over 50 years ago. The fruit is typically oblate in shape, with a loose, easy peeling rind. Flavor is mild but rich. 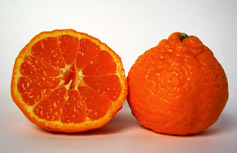 Considered a mid-season mandarin, it is typically harvested late November-early January. The Star Ruby is a result of irradiated seed from a Hudson grapefruit. It was developed through the breeding program of R.A. Hensz of Texas A & I University, Weslaco, Texas. 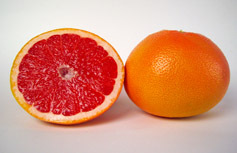 Star Ruby are one of the most darkly pigmented grapefruit on the market today, and have outstanding flavor, with few seeds if any. This variety is typically harvested in late spring-early summer. The Lisbon lemon is one of the most widely grown lemons in California, and is planted extensively throughout the citrus-growing regions of the world. It was first recieved as seed from H.B. Frost of the Citrus Research Station in Riverside, California in 1917. The first budwood was released around 1950.